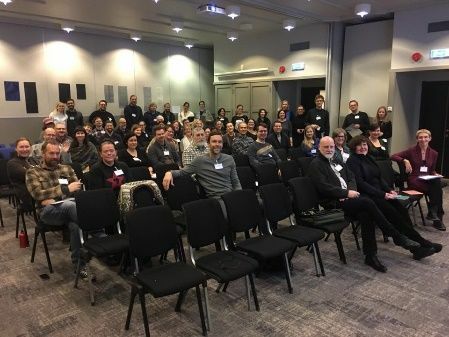 Darkness Conference at the Svalbard Islands, Jan. 15/16 2019: how did it go? 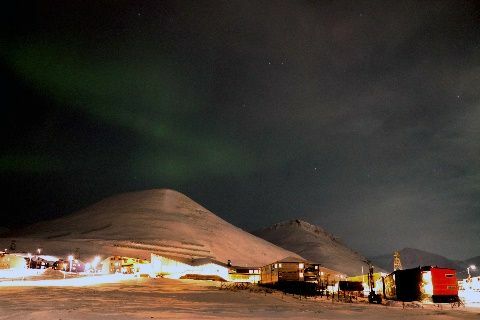 DARKNESS was the topic discussed during the full arctic night in Longyearbyen, the northernmost city of the world (latitude ~ 78° N), in the Svalbard Islands, North of Norway. The conference had over 90 experts from 22 countries, dealing with the topic of darkness from multiple angles. Luciano Massetti presented the joint activities conducted by CNR IBIMET in collaboration with the Department of Biology from the University of Pisa and the BuioMetria Partecipativa project. Q: How did your involvement in the topic of light pollution start? A: Everything started in 2011 when I arrived at the Leibniz-Institute IGB of Berlin. In that occasion I met Dr. Franz Hölker, mind and hand of the project “Verlust Der Nacht”, Dr. Stefano Larsen, and Dr. Michael Monaghan that introduced me to this topic. Before that, I have to admit, as most of the people I was not aware of how light pollution can be such an important treat for ecosystems. In 2013 I applied for a Research Fellowship of the Erasmus Mundus Joint Doctorate Program SMART, funded by the Education, Audiovisual and Culture Executive Agency of the European Commission. 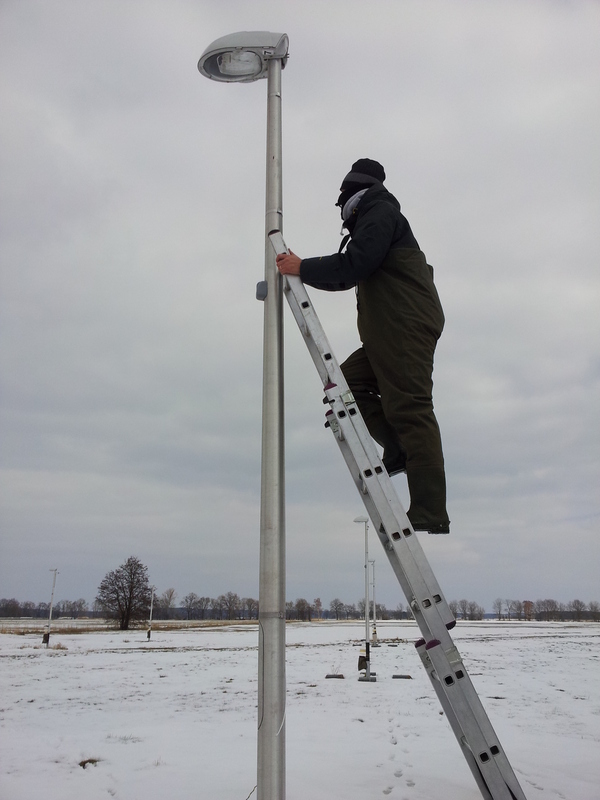 Together with funding also provided by the Federal Ministry of Research and Technology, Germany (BMBF-033L038A) and the Federal Agency for Nature Conservation, Germany (FKZ 3514821700). Everything was set to start my research study on Artificial Light at Night (ALAN). 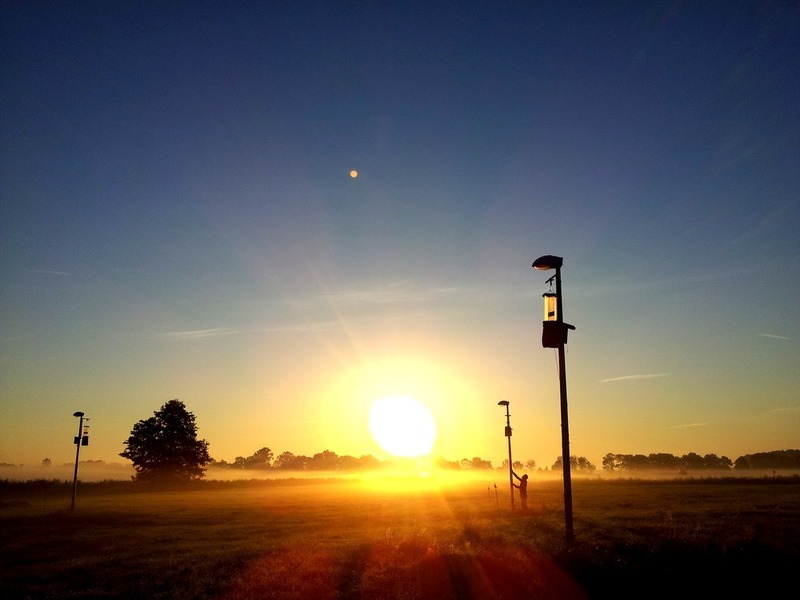 Q: you have recently authored a publication about effects of artificial light at night in Ecology (“Artificial Light at Night Affects Organism Flux across Ecosystem Boundaries and Drives Community Structure in the Recipient Ecosystem“). Could you explain in simple terms the results you obtained? R: This study shows that ALAN not only affect insect and spider behaviour but also changes the dynamics in ecosystems. The light attracts insects, in particularly aquatic insects, from a nearby ditch, and in turn changes the predatory communities of ground-dwelling invertebrates living in the grassland underneath the lights. Here, the activity of several nocturnal spiders and harvestmen increased under ALAN, likely indirectly attracted by the increased amount of “easy prey” in proximity of the lights. 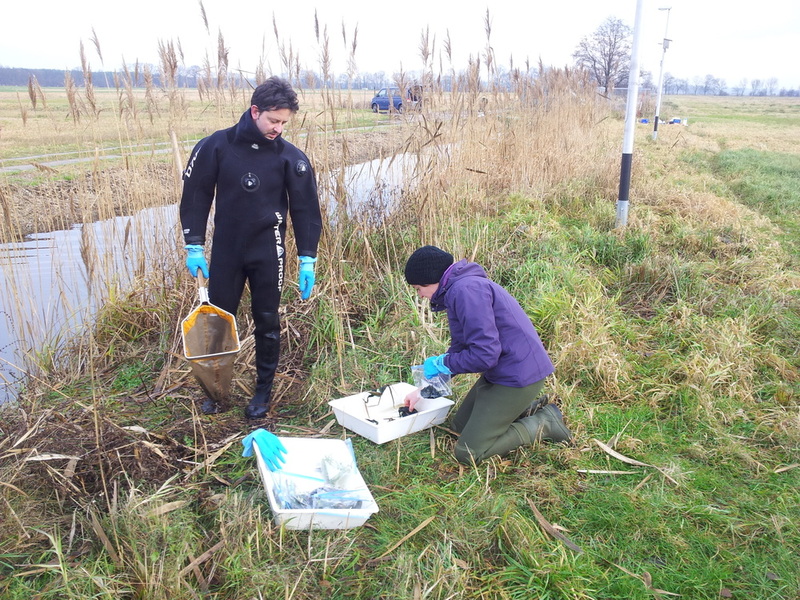 ALAN potentially can change cross-ecosystem fluxes at regional and global scales considering the number of street lights along streams and rivers and along the shores of lakes and wetlands. The presence of ALAN, as important ecological threat for natural ecosystems, should be carefully considered in landscape and urban planning as well as in restoration projects. Q: Your plans for 2018? R: I am planning to publish more research conducted during my PhD related to how artificial light affect predator-prey interactions between aquatic and terrestrial ecosystems. Since August 2017, I started a postdoc at the Umwelt Campus Birkenfeld, University of Trier in collaboration with the University of Duisburg-Essen where I actually work. In this new project I am focusing my research on fish communities and river restoration, planning to bring the ALAN topic also in this field where ALAN is still rarely considered in restoration actions. I will do my best. This week’s English version of the newsletter works in “retrofit” mode for the events, as they took place on Tuesday in Milano, but due to lots of things moving I was not able to send it out earlier. Yesterday, May 30, I gave a lecture at the Politecnico di Milano in the morning, followed by an evening presentation about the BuioMetria Partecipativa project at the Lucernate public library. A substantial news for the week was the signature of a memorandum of understanding between Attivarti.org (the small NGO through which we manage our more experimental activities) and the Italian National Research Council’s Institute of Biometeorology. To learn more about this, please check the related post. On May 28, 20017, in the Grosseto Province Council hall we had a press conference concerning our palla a 21 to Chicago mission. On this occasion we announced a four-team demonstration tournament (to be held on June 30, 2007), which would have represented the final event prior to the departure of our expedition to the US of A. For readers of Italian, you may check the articles published on Il Tirreno and La Nazione back then. Heads up for next week: next even on Tuesday, June 6, 2017 from 4PM to 8PM in Grosseto. More information will follow, or write to info@pibinko.org if you can’t wait. Please note: if you or your friends would like to receive these communications by e-mail, you can subscribe to our mailing list on http://www.attivarti.org/lists (selecting the option for the English-language newsletter). This said, the public side of this week will be quiet, in preparation for the May 30 presentations in Milano (AM at the Politecnico and PM at the Lucernate Community Centre). register for our first palla a 21 ball construction course scheduled in Torniella (Southern Tuscany) for the afternoon of Saturday, June 17. 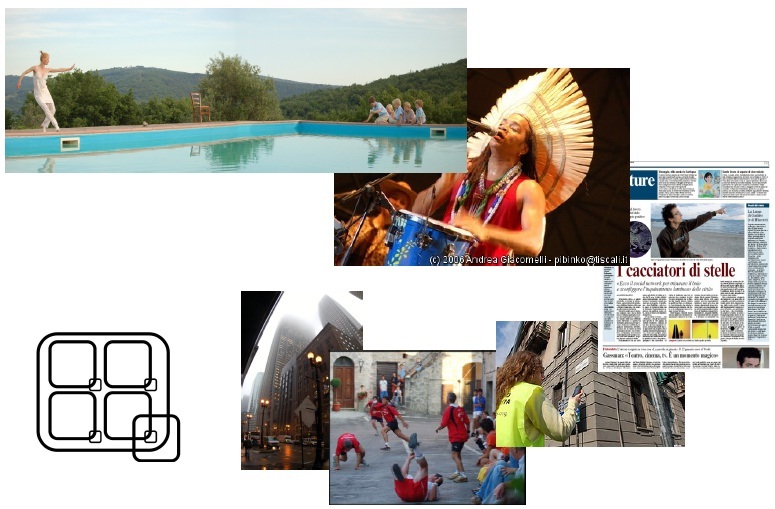 Also: be sure to keep an eye on http://www.pibinko.org/calendar, with five events coming up in June, all in Southern Tuscany (during the Summer season we will tend to roam a bit less, so you will have more opportunities of visting us in our base in the Tuscan hills. If you have not yet seen the summary of the “No music allowed, episode 1” event on May 9 in Torniella, you can check it out HERE. 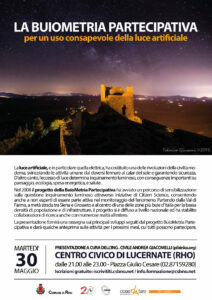 Then, we will be waiting for you tomorrow afternoon (May 16) at the University of Pisa, close to the leaning tower. 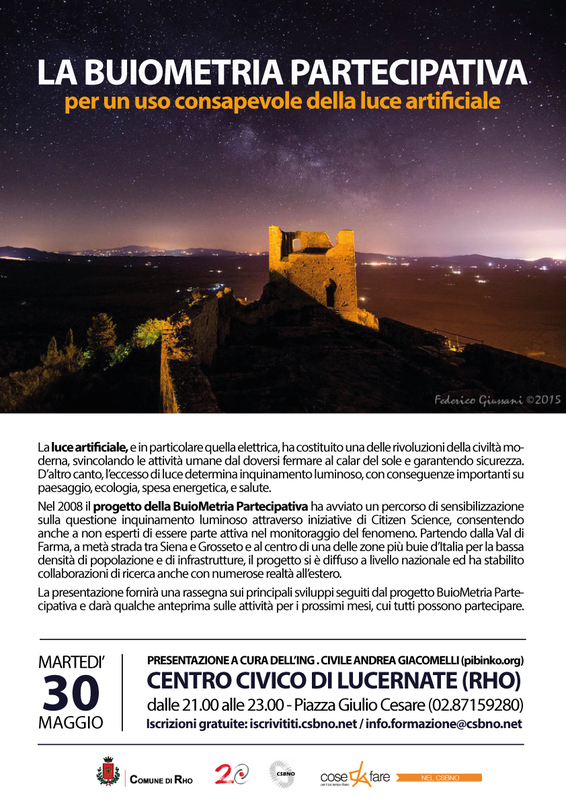 We will give a lecture from 2PM to 4PM on research, outreach, and citizen science applied to artificial light at night, and then have a “debriefing” from 6 to 2PM at la Torre del Luppolo. The presentation of the event is HERE. You should then take note of the two presentations we will have in Milano on May 30. In a sort of “double-feature” event we will first give a lecture at the Politecnico di Milano (from 10.30AM to noon), and then have another talk at the Lucernate Community Hall (from 8.45PM to 10.45PM). Summing these two events you should have an exhaustive view on the projects for m(‘)appare, BuioMetria Partecipativa, and for the intertwining of culture, environment, and open innovation which we have been developing for over ten years from the Southern Tuscan hills. The presentation wll also be the opportunity to learn directly about the pibinko.org + attivarti.org , focusing on the Summer, but already including some hints for the colder months, and providing indications on how to participate in person. Finally, I would like to recall that there are still 47 days to contribute to the Etruschi from Lakota crowdfunding campaign, to print their third album. The campaign is going pretty well, but is not yet complete. You can see what this is about from THIS PAGE.